Posted May 29th, 2013 by David Porter & filed under Sponsorship. With the new season for sports of all kinds now underway, we interviewed local Ironman triathlete, MBF-sponsored, Joe Skipper about how technology plays a part in this sport. 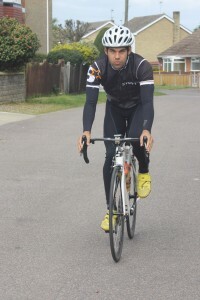 Joe uses a Garmin 305 for monitoring his running progress and a Garmin 800 for cycling. It can monitor heart rate and speed and distance. In the pool he usually relies on timing clocks. Of course he analyses his own stats regularly and publishes then on the Strava site http://www.strava.com/activities/38810529 so followers can keep up to date. But like football managers under pressure, he claims not to be too concerned about how rivals are faring in the stats tables. Joe describes power and weight as ‘the only things that matter.’ He gives cycling as an example. In racing, ‘you can get more powerful or lose weight to increase speed.’ This matters on the uphills, of course, as well as the flats. He says that if you can do both, add a few watts per kilo of power to losing a few kgs of weight, ‘it’s a win-win’ scenario. The Garmin 305 is set in minutes per mile and measures distance and time and pace. On reflection, he thought that like most new ideas, they don’t go down well at first, but you just get used to what there is. Ah, the story of life as far as most technology is concerned, isn’t it?